How Important Is White Space in Website Design? In terms of website design, whitespace is the space left between graphics, texts, columns, margins and those components that make up a design. It is that space which is intentionally left blank for the better readability of the website. White space does not mean the space should be white. Technically, it can be referred to as empty space or blank space and can be of any color, provided, it does not contain any design element / pattern in it. It generally allows users to organize different elements of design for creating a clean content. 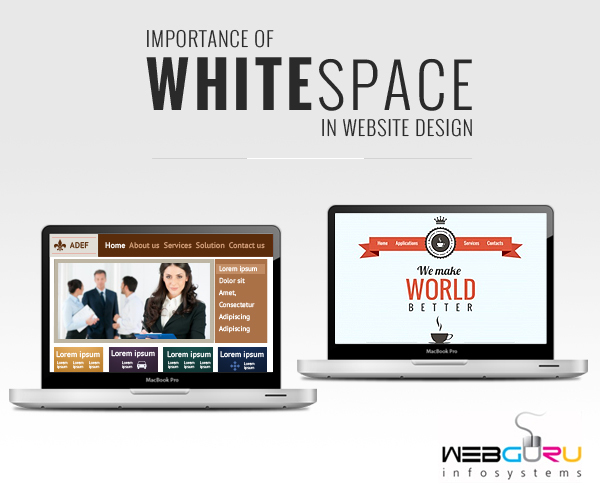 Whitespace is important because it can improve the readability and usability of the website design. Viewing and following through a website needs to be as easy as relaxing. A balanced use of empty space in between design elements along with its sensitive use in the typography can create a sophisticated and elegant look for upscale brands. These white gaps can be active or passive. When it is used to lead a user from one element to the other it is known as active space, whereas the passive form is the unconsidered space between elements. Passive space creates a breathing room for the eyes. Both these types can be manipulated by the designer. The usage of white spaces can differ as per the context of the web design. An E-Commerce website will have a different layout as compared to a photography website or a blogging website which is more text oriented. Whatever be the context of the website, whitespaces are important to keep the navigation smooth. One of the examples we are familiar with is Google. The homepage has abundance of white space with minimal design which naturally focuses our eyes to the center of the page rather than top left where our eyes generally start. White spaces have a remarkable ability to guide the eyes of the users, break continuity and catch attention. Blocks of continuous contents can be easily managed by slightly changing the color of whitespaces. Too much of it makes the design look empty, too little makes the design a colorful mess. Hence, ‘Consistency’ and ‘Balance’ are the most important considerations while using white spaces. Readable texts need more gaps between letters and headers. Text size is also important in this regard. Too small a text shrinks the whitespace in between and needs eye squinting. Larger text sizes consume more whitespace than required. Instead of using up all the space available and stacking tons of information, designers can use it up for innovative spacing and featuring what is really important. Whitespaces should be used wisely after a good technical understanding of what content is to be shown, how much of it is to be shown and why it is being shown. Therefore, it is advisable to finalize the actual content that would be on the website prior to finalizing the design. Whitespaces does not mean just keeping a distance between the elements or components of the design. It should just be enough to create an invisible interdependence of independent elements and sketch out a complete picture as a whole. The most basic principle of an elegant Website Design is the creative use of white space. Although it is a basic principle, yet it is the most difficult aspect of design. You explained the importance of white space very well. Thanks for sharing this. Loads of stuffs to be implemented from the information provided in this blog. Love the blog as well as the image comparing two websites side by side. The image says it all. Keep up the good work. The importance of white space in website design is really very important. It is used to improve the readability and usability of the website design. Thanks for sharing the blog. Great job, keep it up.